“In a bid to ensure our children are getting the nutrition they need while they are at school, The Department for Education has announced that starting this September, schools will receive funding to provide free school meals to infants in reception, and years one and two[i] . Nutrition food standards have also been set that apply across the whole school day, including breakfasts, morning breaks, tuck shops and after school clubs[ii]. The new guidelines state that schools must provide lunches that include fruit and vegetables, oily fish, bread and drinking water. 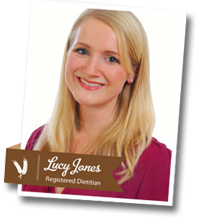 As a dietitian, parents that I speak to ask what this means for their children, including their older children, and how they can ensure their family eats healthily throughout the day, not only during school time. I tell parents that the new guidelines are an important step towards a healthier nation and by educating our children early about healthy eating, they are more likely to make healthy choices throughout their life. Older children will not receive free school meals and many parents ask me how they can ensure their packed lunches provide enough nutrition. My advice to these parents is to ensure their packed lunch follows the new guidelines. 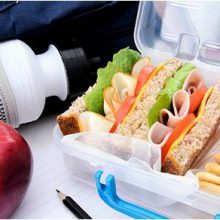 Packed lunches should contain foods that excite children, such as a sandwich with their favourite filling and should be packed full of fibre, calcium and protein. What’s more, I always recommend that providing a healthy breakfast for children is vital as it can positively impact their health and well-being. Breakfast helps us with concentration, energy levels and nutrition. Studies show that skipping breakfast is linked to worse health outcomes, and could potentially affect children’s learning. In my view, healthy breakfasts are vital as a step to help address the growing obesity problem amongst children in the UK as they help to keep hunger at bay and can prevent the need to snack on unhealthy foods while they are at school. 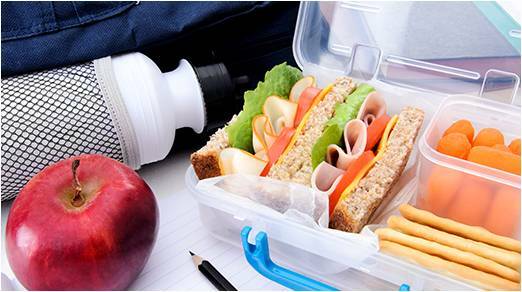 ENERGY – Sandwiches can be a great source of carbohydrate, which is important for children’s energy levels, and are easy to prepare. Both white and brown bread contain complex carbohydrate and make a valuable contribution to a healthy, well balanced diet. PROTEIN – A good source of lean protein such as turkey, chicken, ham, tinned tuna, salmon or low-fat cheese are good sandwich fillers. Nuts are also great for lunchboxes and are packed with protein and essential nutrients but check with your school first that they are allowed before sending in. The protein portion will keep children fuller for longer, help to maintain concentration levels through the afternoon lessons, help prevent the four o’clock rush to the fridge when they get home in addition to providing essential growth and repair functions. WATER- A water bottle will help to keep children hydrated throughout the day, which can assist in mental and physical performance. [i] Department for Education. Universal infant free school meals. July 2004. [ii] Department for Education. School food in England. July 2004.